I was thinking yesterday how incredible it seems that it was less than three months ago that the studio first began to take shape – and here it is, up and running and fully equipped, with the first etching entirely made there nearing completion. Yesterday was a day for retrospection; it was a year ago that my dad died. I think he’d be pretty pleased that his workshop is still in use for creative purposes, continuing the family tradition. … is what I’ve just had. On Saturday I went on a wood engraving course at Red Hot Press, the print workshop I’m a member of, and jolly good it was too. Jutta gave us an excellent exercise to start us off and get us to use different tools to make a variety of marks. We had to divide the block in half and using a leaf as our basic form, engrave one half of the block black on white and the other half white on black. Not as easy as it sounds! I was working on a block about 3cm by 1.5cm, the smallest I’ve ever done so that was a challenge in itself. Not particularly taken with the result but it was a really useful and fun day. Lycoris and Adrasteia are the first characters to be drawn, etched and printed at Project Atelier – and here they are in their first state. There’s a long way to go with this image yet and I’m not sure what the next step will be. With the help of a couple of friends (thank you Gareth and Georgia) it was lifted onto the bench and, after trimming the blankets and putting in the bed, I was printing! Works like a dream; I pulled a perfect cardcut and an etching first go. This morning I mixed up my first batch of copper sulphate solution and etched a plate – another first for Project Atelier. Put the plate through the press and the Undertaker’s sisters-in-law were born. I have my own etching press. I am very happy. The Undertaker’s wife could be found on occasion in the parlour of her husband’s premises, ‘minding the shop’. A spinner by occupation, she would sit at her wheel, treadling rhythmically, left, right, left, right, left right. So smooth and regular were her movements and so gentle the sound of the flyer as it coiled the thread around the bobbin, that her customers would find themselves falling into a reverie as they waited to be shown into the Chapel of Rest. No one minded. She worked with quiet concentration, holding the fibre in her right hand and letting it play through the fingers of her left as it fed through the hooks of the flyer. When it was a little too thick, she would tug at it lightly to even out the thread. 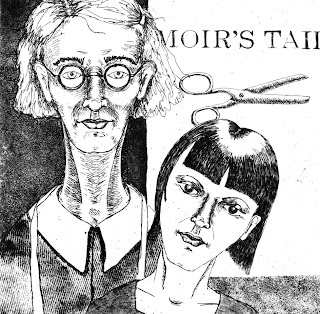 Sometimes, she would bend her head towards the wheel with slight nodding movements which every now and then became so violent that her long, loose hair swung forward and barely missed becoming tangled in the workings of the wheel. The Undertaker’s sisters-in-law are taking shape. They’re a funny looking pair; I like the way that my characters sort of form themselves… they come out how they come out and are quite often a surprise to me. 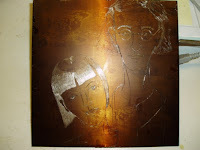 The photograph shows the plate as it’ll be etched in its first state – just the basic outline of the pair. I’ll build up light and dark, tone and texture with successive etchings. It’s funny what a difference putting a print away for a few days or weeks can do for ones perceptions of it. I often dislike work when I finish it and then put it away to flatten. I come back to it later with fresh eyes and it usually (but not always!) looks a lot better. I guess I get sick of the image when I’ve spent a long time working on it and am unable to view it objectively. Such was the case with my cockle wood engraving. I said goodbye to a friend today. I’ve not known her long but have developed a fondness for her and a great respect for her wisdom, compassion and ethics; I’ll miss her. Sad when we have to say goodbye to the really good people. I wanted to give her something to say thank you and the cockle seemed the most appropriate, the sea being a recurring theme in our conversations. I was pleased when I got it out of its tissue. I hope she likes it and it will be a positive reminder of a good ending.